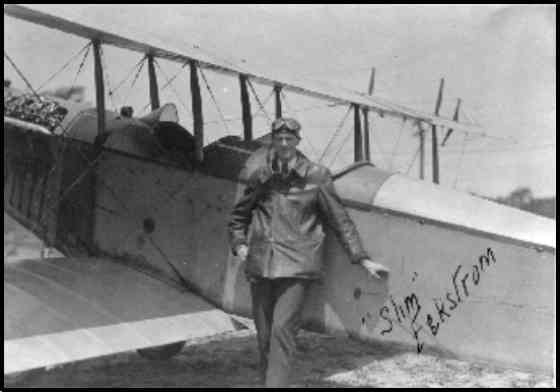 GUSTAV "SLIM" EKSTROM Gustav Ekstrom, was a civilian instructor hired by the Princeton Flying Corps. 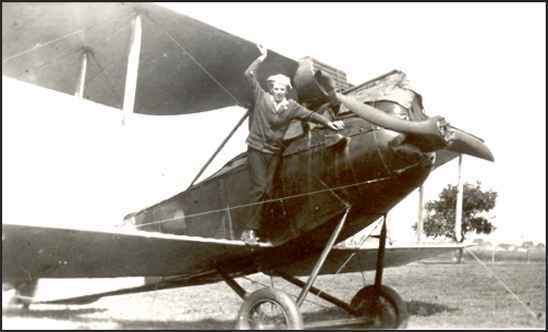 Ekstrom trained at Newport News with Kenneson and soloed on 6 December 1916. Joined barnstroming flying circus immediately thereafter, but when he applied for the Air Service, he failed to qualify. He arrived at Princeton in the early summer of 1917. When Princeton shut down in August, he joined Frank Stanton at the West Virginia Aircraft Company as an instructor, flying both at Princeton and at Daytona Beach, Fla.. In 1928, Ekstrom joined Pan-Am and flew with them until 1955 when he retired. Ekstrom stuttered but worked around his handicap by relegating all radio work to his co-pilot. He passed away July 7th, 1968 in Miami Beach. This photo and brief biographical sketch has been generously supplied by Mike O'Neal. Mike has been compiling a complete history of the Princeton group since around 1980. Over the last few years, he has interviewed many of the families and writes that he is glad he waited just a bit longer to start writing the "final" product. If you have more information or photos of this pioneer aviator, we would love to hear from you. 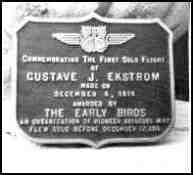 I was delighted to find mention of Gustav "Slim" Ekstrom on the Early Birds website. (His other nickname, by the way, was "Goose.") Gus dated my father's Aunt Olga (Nelson) during the early '20s, and kept in touch with the family well into the '30s. I believe our family lost touch with "Goose" about the time he started flying the Clippers for Pan Am. Naturally, he was a larger-than-life hero to my father. I still have a couple of snapshots of my father (then in his early teens) perched on an ex-WW I Rumpler Gus brought to Racine, WI while flying for some aerial photography in the area. He planned to hop Dad the next day, but an overnight thunderstorm wrecked the plane and they never again had the chance to fly together. I am the only rated pilot in the family, and I truly regret I never had the chance to meet ol' "Goose" and hear some of his stories. Thanks for your efforts in keeping the memory of these amazing flying men and women very much alive. Byron J. Langenfeld This photograph is dated 1923, and shows my late father, Byron J. Langenfeld, on the wing of the Rumpler C VII which Gustav was flying (around the Chicago area, if memory serves) with an aerial photographer. He stopped in Racine, WI, to visit my dad's Aunt Olga and to give some rides. Hours after the photo was taken, a severe thunderstorm destroyed the plane. Gustav Ekstrom Gustav "Slim" Ekstrom, pioneer barnstormer and airline pilot, died July 7, 1968. Funeral services were held July 10th at the Van Orsdel Chapel in Coral Gables, Florida. His ashes were scattered over the Carribean Sea by his widow and two old friends, who had promised to do this. His last flight took less than 10 minutes. 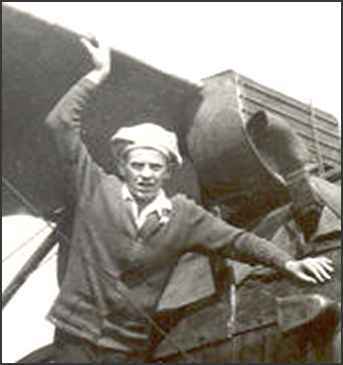 Ekstrom's flying career began at 19 when he got a job in a barnstorming flying circus that toured the country. After that, he was employed by Pan American which started him flying small seaplanes in 1928 and then moved him up to the luxury Clipper Flying Boats, and finally the big 4-engine transports. At the mandatory retirement age of 60, his flying career ended in 1955. Gustav Ekstrom was born August 18, 1895. His first solo was made December 6, 1916. Death came as the result of a heart attack, his first serious illness. He is survived by his wife, Margaret and three brothers. Margaret Ekstrom News of Margaret's passing at age 91 on September 5, 1994, at her home in Coral Gables, Florida, was recently reported. She was the wife of Early Bird Gustave. J. Ekstrom who preceeded her in death in 1968, and was a Life Member Associate Early Bird. During recent past she fell while using her walker, breaking her hip, but recuperated sufficiently to accompany a friend on weekly dinner engagements. She was very independent, refusing to have a live-in companion, but a neighbor looked after her daily. When he tried to move her to a safer place during Hurricane Andrew, she adamantly refused. She met her husband Gustave at a dance in Coral Gables in 1927 when he operated a Curtiss Flying Service. Later he flew for Pan American Airways until his retirement in the late fifties. Margaret, Peggy to her many friends, was cremated and ashes were interred in the family plot in Virginia. Newsletter of The Early Birds of Aviation, Inc.